Peacock and peahen are considered to be one of the most beautiful birds that are currently in the world. They have long and flashy feathers, which form the epitome of their beauty. In addition, their appearance and behaviors have been a source of attraction to many people who want to be treated with an uncharacteristic dance that is not offered by other birds. However, not many people can tell the difference between their sexes. Peacock is the male bird, which is highly known for its beauty and behavior. It is the largest among the two with several studies revealing that it weighs an average of seven kilograms when well fed while at the same time being kept in a conducive environment. The peacock has a decorated tail feathers referred to a train. Moreover, the bird has an estimated length of about 46 inches. The term peahen is used to refer to the female peafowl, which is smaller than its male counterpart weighing an average four kilograms. Peahens are less colorful with a general brown color and less train. One of the main differences between a peacock and a peahen is their colors. Peacock are colorful and attractive because they have to attract females for mating which can only be achieved if one is bright enough to attract a mating partner. On the other hand, females are dull and less attractive because they do not have to attract males for mating but they have the final call on who will be their mating partners. One of the remarkable things to note is that peacock has distinct colors along the tail as compared to the females. It has been concluded that the beauty associated with peafowl is only derived from peacock because people pay less attention to the female peafowl. The second difference between the male and female peafowl is their sizes. Peacocks are said to be larger in size and weight while peahens have a moderate size. Several research studies have concluded that the average weight of a peacock ranges between five kilogram and seven kilograms. However, the bird must be well fed and kept in a conducive environment for it to have such weight. On the other hand, a peahen is considerably smaller with an average weight of four kilograms and much less length. In many of the research studies conducted concerning peafowl, the findings indicated that the male peafowl measured between forty to fifty inches between the tail and bill while the female could not meet a third of its male counterpart. Tail feathers form another distinguishing factor between male and female peafowls. Peacocks have more and beautiful feathers as compared to their female counterparts who have few and dull colors. On average, a peacock has about two hundred feathers on its tail, which have different colors and are attractive because they form a color panel. On the other hand, peahens have more than one hundred feathers slightly on their train, which are dull hence not attractive to watch. Besides, peacock feathers are very long despite them being many and colored while peahen feathers are considerably shorter. It is essential to perceive that the length of the feathers significantly contributes towards the length of the peacock. The sounds produced between the two when expressing their feelings is distinctively different. A peacock sounds louder than the peahen, which does not call loudly. It is necessary for the peacock to call louder so that it can create attention to the female peafowls who have the last rights and decision makers of the peacock that they will mate with. This explains why peacock will most of the time produce louder calls while their female counterparts’ only produce moderate calls, especially when mating or when calling their chicks. The other distinction between a peacock and a peahen is the performance of dances. A peacock performs dances while the female does not perform dances. 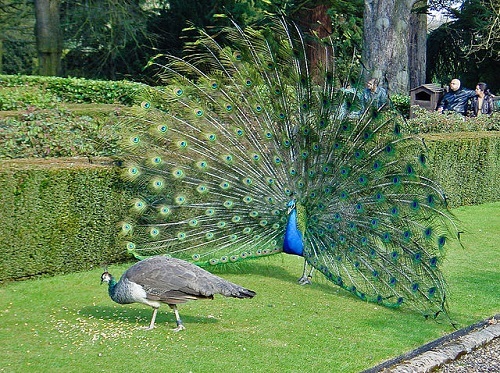 Many people have witnessed a peacock erecting its tail while at the same time fluttering its wings with an attempt to attract attention from the peahen for mating purposes. On the other hand, the peahen does not perform any dance, but she keenly watches as the males perform their dances upon which she selects the best dancer for mating purposes. People are highly interested in the male dances because they provide an opportunity for witnessing a phenomenon that is not so often among birds. Lastly, females have the responsibility of incubating eggs while male peafowl does not hatch. This is unlike other birds, which share the incubation process between male and female. However, both peacock and peahen have the responsibility of feeding chicks once they hatch. The incubation period for a peahen is about thirty days. Peacocks and peahens are one of the distinctive birds that provide a mesmerizing phenomenon that is appreciated by all human beings around the world. The two birds are known for their beautiful feathers, which have different colors making them worth to watch. Besides, the birds perform dances (peacock) to attract their female counterparts (peahen) which shows that birds put effort, which is the same for human beings. However, it is important to highlight that there is significant number of differences between a peacock and a peahen, which ranges from size, color, dances, sound, and incubation among others. It is essential for one to understand the differences between the two birds. Jecinta Morgan. "Differences Between Peacock and Peahen." DifferenceBetween.net. February 19, 2018 < http://www.differencebetween.net/science/nature/differences-between-peacock-and-peahen/ >. Galusha Jr, J. G., and L. M. Hill Jr. "A study of the behaviour of Indian peacocks (Pavo cristatus) on protection island, Jefferson County." Washington, USA: Pavo 34 (1996): 23-31. Heinemann, Jack A. "Bateson and peacocks' tails." Nature363.6427 (1993): 308-308. Sasaki, M., T. Ikeuchi, and S. Makino. "A feather pulp culture technique for avian chromosomes, with notes on the chromosomes of the peafowl and the ostrich." Cellular and Molecular Life Sciences 24.12 (1968): 1292-1293.